In these dusty days of summer, the heat can feel relentless, so what better way to spend a day than wandering the Woodland Garden at Heronswood. Enjoy dappled shade beneath a canopy of evergreen conifers, where jewel-like lilies and gingers bloom in abundance. Most woodland gardens peak in spring, when early perennials and bulbs make the most of the extra rays of sun that penetrate winter’s denuded branches. However, careful planting here at Heronswood has extended the color season through fall and hydrangeas are currently the stars of the show. Though sometimes viewed as a bit old fashioned, hydrangeas are enjoying a renaissance with a greater diversity of species and hybrids becoming available. In no small part, this is thanks to our director, Dan, who has sought rare species in the wild, while also sampling the best garden varieties from Japan. Heronswood holds numerous fabulous lacecap and mophead varieties, but also a range of rare species, such as Hydrangea sikokiana, now flowering. The purple-leaved Hydrangea aspera ‘Plum Passion’ is another Dan discovery, adding brilliant foliage color to hydrangea’s already abundant charms. We continue to collect seed from these purple plants in the hope of developing more intense foliage colors, though in truth, the mature plants in the Perennial Borders are already tip top. The hydrangea family contains more than just hydrangeas and our collections include several relatives of note. Herbaceous Kirengeshoma has waxy yellow flowers that are almost lily-like, while hydrangea-vine (Schizophragma) clothes several of our larger trees. 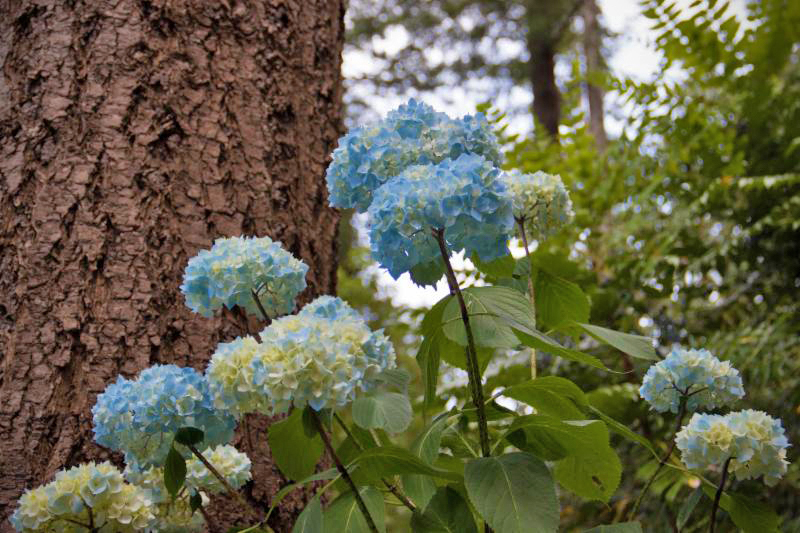 Both are flowering now, as is shrubby Dichroa with electric blue blooms. 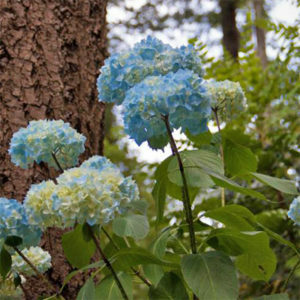 Hydrangea flower color has long been a subject of scientific interest as in some species (Hydrangea macrophylla and H. serrata), it is determined by soil chemistry. Pigments in the petals react with aluminum in the soil, turning blue. On acidic soils, aluminum is soluble and available for plants to absorb, but on alkaline soils, it is insoluble so petals are pink. Whatever the color, our hydrangea collection is inspirational and well worth a visit.